Some two years ago we made our first trek to the magical black sand beach and mystical waterfalls of the 5th wettest place on the planet. Ureka. It’s no easy ride to get there – what with getting the right permit, figuring out transport (particularly when the pool of licensed drivers here has considerably shrunk) and navigating the 16% gradient roads. So you never really know when (or if) you’ll be lucky enough to return to paradise. The day started out as planned. A bus of intrepid travelers left early in the morning. Our convoy of three utes followed some 30 minutes after. The drive is something like two hours – you follow the road to Luba, pass through the military checkpoint then continue UP – up the road, over a mountain and down again. It’s slow-going; your vehicle crawls up the asphalt in low gear and you keep your fingers crossed that you’re going to make it. Having learned from our experience two years prior (when we had to abandon a vehicle at the bottom of the hill and somehow pile 4 extra people into the remaining truck) it was sensible to bring more than one vehicle in the convoy. Lesson: always make sure you have a spare. Unfortunately, once again, the hill conquered us and took another vehicle as its victim – this time on the way UP not long after 9am. After some discussion, and the realization that there was no cell reception where the truck had broken down, the decision was made for some of our party to return to Luba to call for assistance. The sad and frustrating end result, was that one truckload of us had to abandon the day-trip and head back to compound. Not a great outcome given the amount of trouble to actually organize and get to our destination! But, such are the trials that come with living in EG. The rest of us then began our trek. 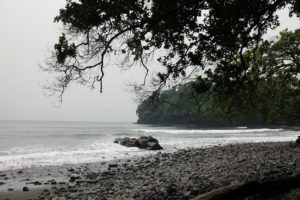 Upon arrival, you gaze out at a long, long stretch of beach, waves crashing in on the sparkling black sand. In the morning the beach is generally deserted. There may be one other group walking along the sand in the distance. It isn’t until later in the afternoon that you’ll see larger groups of locals hanging out playing soccer, grilling food. Alongside the carpark is a skinny waterfall trickling down onto the sand; known by some as the “first” waterfall (you’ll realise later that this carpark waterfall is just a teaser and doesn’t count after you’ve seen the next three!). Some simply choose a spot on the sand and set up for a few hours. Otherwise, to see the other waterfalls you must wander along the beach for some 40-odd minutes. 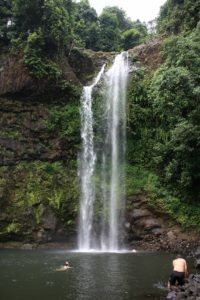 After crossing a couple of ocean streams (with water which could be up to your knees or up to your chest depending on the time of day) over to the left you will find waterfall number 1. Normally one can set up here nicely enough and go for a dip – unless there is a guy fishing in there with hooks that are just waiting pierce your skin. So then, it was on with the covered footwear and after a quick mist of bug repellent we were off into the jungle to find waterfall number 2. The walk to waterfall 2 isn’t long, but the path does meander up and down; and with fallen logs and slippery mud it can be cumbersome to navigate. Waterfall 2 has shorter falls that turn into small rocky rapids – and if you’re planning to scoot down the rapids into the pool at the end – mind that those rocks are sharp. After a chilly dip in the deep pool and a packed lunch, to my delight the consensus was to continue on to the third (or is it fourth?) waterfall – the mystical number three. 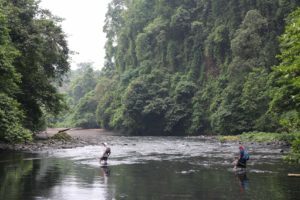 The walk to the third waterfall is short – just past the camp for the university group that stays for four months during the dry season to study the massive turtles that lay eggs along the beach – and you’re there. The last waterfall is like something absolutely out of a fantasy novel. My attempts to replicate the scene in writing are inadequate. It is nothing but indescribable. The water cascades down from a height into a quiet pool. Once again, I swam across the water and behind the gushing curtain. 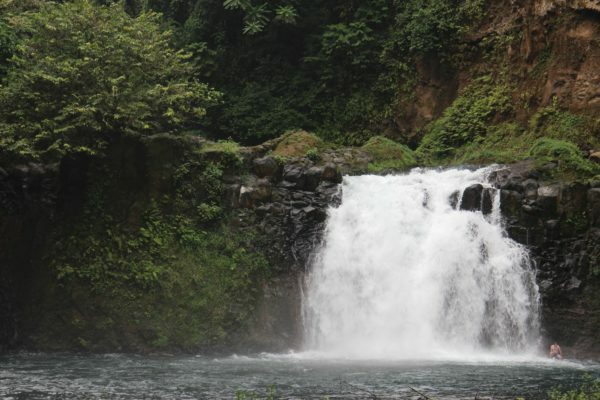 The water falls with such power that it’s scary, it steals your breath, making you gasp. Despite the logistical challenges, this place is less than a once in a lifetime opportunity. The percentage of people to have experienced this paradise is minuscule. And I am privileged to have now witnessed it twice. To see how the waterfalls were the first time round see Behind the Waterfall. Monique……this is a beautiful piece and so accurate. One of the most beautiful places I have ever been. Didn’t make it past the waterfall at the car park as it was high tide so your account gives a glimpse into what I missed. Did however make a five hour hour trek through the jungle to the southern university camp at Moraca Playa and it was magical.